Hey everyone! Did you have a good weekend? I did, although I'm still in disbelief that we are actually in September already. I really dislike sounding so cliche, but, time is flying! I just want to slow it down, or freeze frame it once in awhile... What about you? Did your summer fly by? What are you looking forward to this coming fall? I need to freeze moments , too!!!! I was trying to work out what that little green thing was on the right of that red lantern looking object! 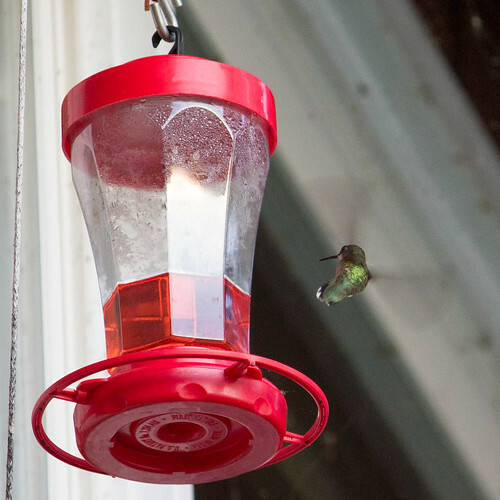 Then I realized that the red object with an equally red liquid inside was a feeder and the little green thing had the faintest of wing patterns going so fast they were just a blur. It has to be a Hummingbird! Right? I love the month of September, much more than the heat-waves of the summer, so I really feel good right now, despite having to work again! Hi Kate, this is my first post here on your blog which I found through Ravelry, by the way. Your crochet work is stunning and I appreciate the tutorials with great pictures! I'm looking forward to much cooler weather this fall as we've had high heat and humidity in our area all summer. The cooler weather brings on my desire to knit and crochet a lot more. Thank you so much, I'm glad you like the tutorials! When I'm sad that summer is over, I too think of all the crocheting that could be done in the cooler weather!! Thanks! I was surprised that I got it... those little buggers move fast!! Where did summer go? It was over in a blink. Temps here in Florida still feel like summer (high 90s most days), but I know fall is just another month or two away. I'm looking forward to cooler days and nights and being able to use some of the crocheted items I've made. Yes, almost time to pull out the crocheted blankets!! Hope it starts to cool down for you! I'm making a sampler blanket and a sweater at this time. Looking forward to some nice "suburban hikes" in sunny and cool weather. Great! I'm hoping to do some hiking this fall as well!